How to use IRC to get connected with others in the Mozilla project is shown on this page. Also frequently used IRC channels with descriptions of their general purpose are listed. And some instructions for the non-technical folks on how they can join an IRC chat are given. 1.12 Join some channels right now! 2 Need General Help with IRC? 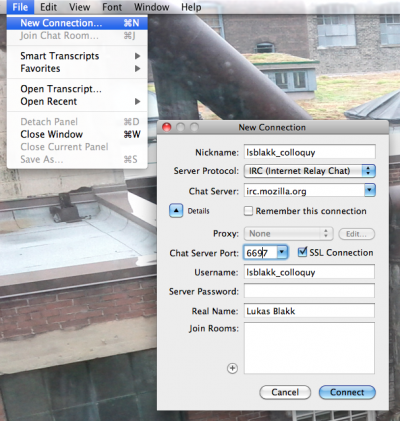 IRC stands for "Internet Relay Chat". It's a protocol for real-time chat sessions. (Read more about IRC on Wikipedia.) It was invented before the World Wide Web, so it was adopted by early open source contributors and Web developers, and it has been used by those communities ever since. Like email, no single company controls IRC. IRC servers are offered by many individuals and organizations. Users log in to a particular server to chat with other users on that server, using a client program designed for IRC; just as there are many programs for reading email, there are many different IRC client programs. Chat discussions take place in "channels," which have names starting with a '#' symbol. Mozilla runs an IRC server to host channels for discussion of topics related to the Mozilla project. Despite our very best efforts, occasionally people do experience behaviors in IRC that are not inline with our Community Participation Guidelines. If happens to you, please reach out to the channel moderator or use our reporting hotline. There are several ways to participate in IRC and here are a some common options. Kiwi IRC Open Source web-based chat client that works on mobile too. Chatzilla is an add-on for Firefox; it comes built-in with SeaMonkey. You can also install it standalone. Konversation is a client for Linux, you can probably get it as a package from your distribution. Its look and feel is similar to that of ChatZilla while being built on KDE. Colloquy is a Mac client with a nice looking interface. It also has a mobile client for iPad/iPhone/iTouch. Limechat is a cross-platform IRC client by Satoshi Nakagawa. Warning: main site is in Japanese, this is not just for Mac, there are Windows and iOS versions as well. A number of people have happily switched from Colloquy to Limechat. Thunderbird is a communication client made by Mozilla. As of version 15, it has IRC support. Instantbird is a cross-platform multi-protocol instant messaging client based on Mozilla technologies (and libpurple from Pidgin) with an emphasis on simplicity and extensibility. Yaaic is a free (as in freedom), multiserver, Android IRC client, now fully conformant with the UI style of the Iced Cream Sandwich (and later). AndChat is a free (as in beer), multiserver, IRC app for the Android platform. HexChat is a great chat program for both Linux and Windows. IRCCloud is a great IRC app that is compatible with Android phones, iPhone, iPad, and iPod touch. This app is optimized for iPhone 5. Requires iOS 5.1.1 or later. It has both a free and a paid option. See also Comparison of IRC clients at Wikipedia. Use the /networks command to display the list of predefined IRC networks. Click on moznet in the list. Nicknames on IRC can become a major part of your identity if you spend a significant amount of time talking with people in IRC. Sometimes you may even find that people in real life call you by your IRC handle. If you're having trouble coming up with a catchy nickname or if you're concerned about getting stuck with something that seems funny now but will be tiresome to you in a few weeks, a good way to create a nickname is to take the first letter of your first and most or all of your last name to make a nick that people will recognize as you. Often in IRC people look for others by using tab complete so if someone's name is John they might type a 'j' and then tab several times to see who's in the channel whose name starts with a 'j'. (where NICKNAME is the desired nickname); or if you are using a client you may have already set your nickname and/or can change it through the application's interface. Note that if someone has already registered your preferred nick, you’ll need to use a different one. Get the confirmation code from your email inbox. Type the following command and replace confirmation_code with the code sent to you in the email (NEVER replace the word "nickserv" in /msg nickserv ... with your nick). It has the template shown below. If you don't see our email in any folder (check spam too) you could try /nickserv resend . "Your email address of [YourEmailAddress] has been confirmed". Once you have identified yourself, you will be able to join password-protected irc channels and also, if needed, disconnect anyone using the nickname without the password. See /msg NickServ help for details. Using the /umode command with one of the following parameters will cause the specified effect. +B - Marks a user as a bot for /whois reporting purposes. +x - Cloaking - Hide part of a user's hostname (on by default). +c - Blocks private messages from everyone except for people that are in at least 1 channel with you. +R - Blocks private messages from unregistered users. +d - Deaf - Stop receiving channel messages & notices. Useful if you want to silence all the channels you're in, but still be available for /msg. +I - Hides the list of channels you're in from other users when they /whois you. If doing this command does not open a new tab or otherwise allow you to enter the channel for discussion, please check the steps above about registering your nick and make sure you have identified yourself to Nickserv. This creates a new tab or channel that is just between you and that person. You must have a message to create the new tab/room otherwise the /msg command will complain that there are not enough arguments. which will tell you (hopefully) their real name as well as list the channels they are currently in with that nick. Now you can tell all your friends, teammates, community members where to find the backchannel you've created! # eg: /msg chanserv register #moz-in-my-town "a channel for people who work on mozilla and live in my town"
For a list of all channel modes supported by our IRC network, please visit . A list of particularly unique & interesting channel modes follows. +u - Auditorium mode - Hides everyone in a channel except yourself (potentially useful for #moco or #townhall). +e - Ban exception - Same syntax as +b, but allows you to exclude someone from a ban. +B - Block ALL CAPS MESSAGES. +c - Block color messages. +S - Strip color from messages. +g - Message filtering using simple string matches. Example: /msg chanserv mode #channel lock add +g *candy*. Now, no one in #channel can use the word candy. Use multiple lock add commands to add more words. To see the list of banned words, omit the + symbol, e.g. : /mode #channel g.
+d - Silence join/part messages until the person speaks. Useful for channels with people who, e.g., IRC from their laptop and flood channels with join/quit messages every time they close their laptop. +f - Flood protection - Example: /msg chanserv mode #channel lock add +f 7:3 - If a user types 7 or more line within 3 seconds, they will be kicked. You can also do /msg chanserv mode #channel lock add +f *7:3 to make them kickbanned instead of just kicked. +j - Join Flood Protection - Example: /msg chanserv mode #channel lock add +j 20:5 - If 20 or more clients join #channel within 5 seconds, the channel will be locked for 60 seconds, preventing anyone from joining. +N - Prevents users from changing their nick while in a channel with +N set. Can also be used as an extban to prevent a specific user from changing their nick, e.g. : /msg chanserv mode #channel lock add +b N:lerxst! *@* would prevent lerxst from changing his nick to anything else. +b m - Mute - Extban for preventing a user from speaking in channel. e.g. : /msg chanserv mode #channel lock add +b m:lerxst! *@* prevents lerxst from speaking #channel. +l x - Limit - Prevents users from joining a channel if the number of clients exceeds x. Example: /msg chanserv mode #channel lock add +l 5 prevents users from joining #channel if there are already 5 users present. +L - Redirect - If a channel's limit is exceeded (via +l), this forces users to join the specified channel. Example: /msg chanserv mode #channel lock add +L #channel-overflow. If you want to redirect everyone attempting to join a channel, set +l to 0. Join some channels right now! Being new to IRC can be intimidating. Mozilla's IRC channels are very friendly and welcoming but some of them are geared to teams trying to get things done where others are more relaxed and open to new folks giving IRC or other Mozilla tools a try. #newbies - kind of self-explanatory, right? Need General Help with IRC? If you're able to connect to IRC and join channels, try asking for help in #introduction, #mozillians, #newbies, #seneca or #coding. The folks who hang out in those channels will be happy to help. This will give you a list of all the IRC commands and then you can do /help [command] to get info on that particular command. Sends a message to a nick or a channel. Usually this is used for sending private messages to other persons. /MSG friend Hi, what's up? You can also visit irchelp.org to learn about how IRC works, or find a client you can use to connect to the chat server. Join a question-friendly channel like #introduction, #mozillians, #newbies, #seneca or #coding. Ask away! You don't have to ask permission to ask first. It is better to just blurt out your question, even though you don't know if anyone is paying attention. Be prepared to ask in several places. Very often the first response to a question is, "I don't know, but you should ask that question in #developers or #devtools or #jsapi or any of a hundred other special-purpose channels. Over time, you'll get a better sense of which questions to ask where, but to start with, it's always OK to ask in #introduction. Remember to be courteous. Don't repeat your question every time someone new enters the room. Don't individually ask everybody in the room if they know the answer. Don't type helllooooooooo. And if someone is rude to you, please do the rest of us a favor and respond politely anyway. There are many different irc channels for various topics. If you have ChatZilla, you can just click the provided links below to join that particular channel. For other clients, connect to server irc.mozilla.org and type /join channelname, replacing channelname with the name of the channel (including the leading "#"). All channels use English unless otherwise specified. These channels are frequently used for discussions regarding development and planning of Firefox and Thunderbird. #balrog - Balrog (Application Update Service) project discussion. #calendar - Calendar project and Lightning. This addon is for Thunderbird and SeaMonkey while the freestanding Sunbird isn't actively developed. #testpilot - Discussion about the Test Pilot project prototyping new features in Firefox. When you connect to our IRC server, you will get portscanned from 63.245.208.159, 63.245.212.23, or 63.245.216.214. This is an unfortunate but necessary step in order to cut down on the number of viruses and other malicious users attempting to communicate via our IRC servers. The portscan is checking for common ports used by known viruses and open proxy servers to ensure that your machine is not infected before allowing you to remain connected. By connecting to our IRC servers, you agree to have your computer portscanned by our server. If you don't like this, don't connect. Our servers do not keep records of any of your conversations, but anyone in the channels you are in might do so and publish those conversation logs (and some channels are actively logged by users on those channels). If you have questions about this, ask the other users in the channel you are concerned about (every channel has its own culture). In general, you should assume that anything you say on IRC that is not in a private message will be recorded and possibly published somewhere, and even then you are depending on your trust that the person you are sending the message to will not to share it. Sometimes people say silly or memorable things on our server. We memorialize them forever on the quotes database managed by Tim De Pauw. If you have access to a host that is always on you can run an irc session on it and connect/disconnect from that session without losing everything. This allows you to keep scrollback, stay present in channels when you are away, and have logs of what happens when you're not around. In this example I will use people.mozilla.org as my host. If someone can add good instructions for setting up a proxy in another way, please do. This tutorial will assume that you have an account on people.mozilla.org (or another server where you can ssh to it and run both 'screen' and 'irssi'), details on how to set this up are below. An alternative is ZNC. Replace <nick> and <password> with your registered Mozilla IRC nickname and password. The following creates an autoconnect to irc.mozilla.org under the name Mozilla. Replace #channel with the channel you'd like to add. <pass> is an optional field, used when an IRC channel requires a password.